With maps and insider tips, this sleek travel guidebook will take you through the best of Vegas, baby! Here's what to see and do, and where to eat, drink, shop, stay, and play--from Downtown to The Strip, from nearby luxury resorts to the desert's natural wonders! ''Top Picks'' direct you to not-to-be-missed attractions. 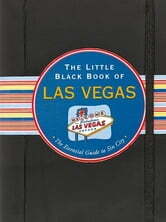 Includes 7 maps, including Downtown, North Strip, Central Strip, South Strip, Beyond the Neon, a Las Vegas Transit Map, and a Las Vegas Monorail Map. Take this street-smart city guide with you and make the most of your trip to the neon and beyond! Sigla editoriale: Peter Pauper Press, Inc.